MUSKEGON – Playing tougher competition can bring tough results, at least in the beginning. The Muskegon Risers indoor soccer team has already discovered that. Last winter the Risers spent their first indoor season as a member of the Premier Arena Soccer League, which is considered a Division 3 league. They did well, compiling a 5-2-3 record and barely missing the league playoffs, despite the fact that many of their players had limited indoor soccer experience. This year the Risers have moved to the Major Arena Soccer League 2, which is a step up the competitive ladder from the PASL. Their season began with two road games in mid-December, and they quickly learned that they will have to play much better to keep pace with their new rivals. The Risers lost both games pretty badly – 15-4 to the Chicago Mustangs and 8-2 to the Cincinnati Swerve. They will try to reverse their fortunes in their first two home games this weekend, on Friday against the Chicago Mustangs and on Saturday against familiar foe Detroit Waza Flo. North Muskegon grad Justice Sikkema in action for the Risers last season. Both games will be at L.C. 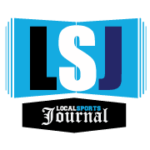 Walker Arena at 7 p.m.
“It’s a much higher level,” said Risers head coach Ben Ritsema about the new league. “Last year we played in Division 3 and this year we will be Division 2. Many professional teams put a team into this league and have many more resources. The Risers headed into the new season with a lot of new faces. Only eight players return from last year’s team. They also have a roster that is very Muskegon-oriented. A total of 13 players on the 30-man roster (20 are allowed to dress for games) are from the area, which is a rarity in semi-pro soccer, according to Ritsema. Ten players have experience with the Muskegon Community College men’s soccer team. Some of the more well-known local players on the squad are former high school stars, including Noah Hendricks from Fruitport, Justice Sikkema from North Muskegon and Cody Loss from Reeths-Puffer. The local connection also features team owner Matt Schmitt, a former Reeths-Puffer and University of Michigan standout, as well as his brother Michael Schmitt, who excelled at Reeths-Puffer and the University of Charleston. 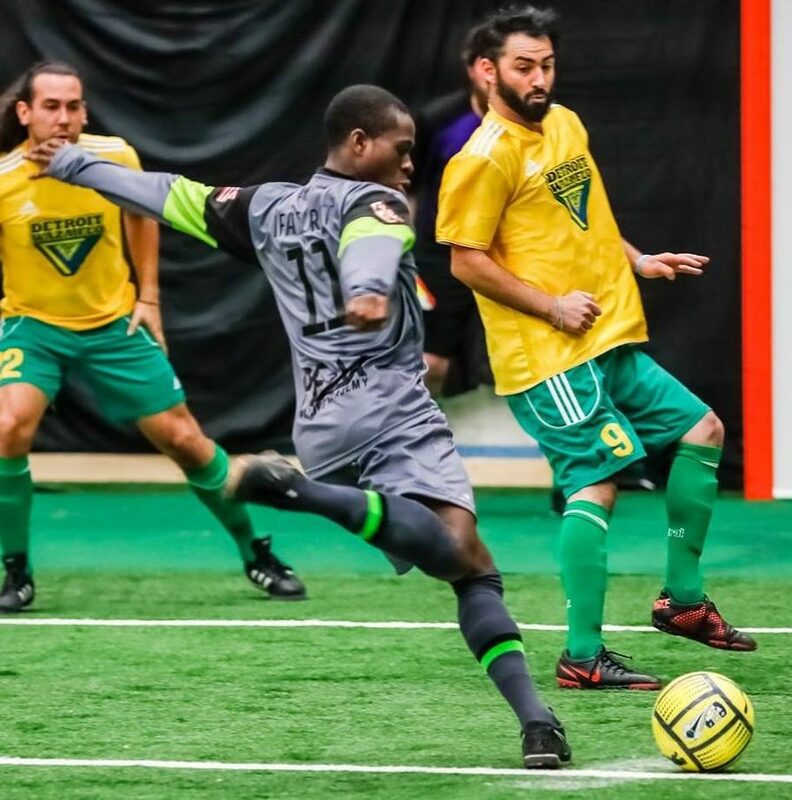 TJ Ifaturoti, seen here about to unleash a shot last season, is expected to be a leading scorer for the Risers again this season. Michael Schmitt, who played with the indoor Risers last season, has developed into a defensive anchor for the team, according to Ritsema. Muskegon fans will happily welcome back two foreign-born players – Stu Collins from Ireland and TJ Ifaturoti from Nigeria – who both played key roles for the Risers last season. Ifaturoti was one of the team’s most dangerous offensive players last year, and is expected to be a scoring threat again. “He joined halfway through last year and he really gives us speed up top along with a scoring threat,” Ritsema said. Also back from last year is starting goalie Tim Bergsma, who played at the University of Michigan. He was in goal for the first two games in December, but is likely to miss both home games this weekend due to work commitments. The Risers are trying out three new goalies this week, hoping to find a quality substitute who can step in and play well on Friday and Saturday, according to Ritsema. There will likely be other new faces on the roster as the season progresses, Ritsema said. Competing in a tougher league means the Risers will have to be constantly on the lookout for players who can give them an extra edge. The Risers will have several new welcome features for home games this year. They will play on the new turf that was first used by the West Michigan Ironmen indoor football team last season. They will also have new goals, which are embedded into the walls of the playing surface, replacing the temporary goals that were used last year.